1 Why does my PC run GW2 so poorly? Why does my PC run GW2 so poorly? The main bottleneck for most systems is the CPU because GW2 is VERY processor dependent. It’s normal for MMORPGs to be demanding on CPUs because of the sheer number of players on screen that must be processed. But I would argue that GW2 is more CPU dependent than the average MMORPG. To understand why this is the case it might be useful to look back at the history of Guild Wars 2’s development. 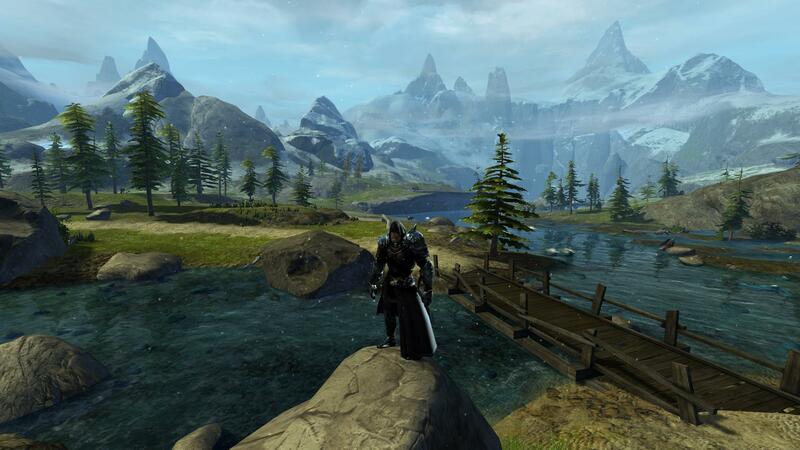 Development for GW2 began all the way back in 2007, borrowing heavily from the original Guild Wars’ code. Keep in mind that dual-core CPUs were just beginning to be adopted, so optimizing GW2 for multi-core processors was not a top priority. During this time DirectX 9 was the most widely used graphics API and DX10 was not yet widely supported. So GW2 was developed with DX9 because of its timeliness and also because they wanted to support as many different hardware setups as possible. This is important to note because the newer DX11 and DX12 both offer significant improvements and optimizations that can improve CPU usage and reduce load. Now this doesn’t mean that it was a mistake for GW2 to not adopt a newer version of DirectX, and in fact, there are many benefits to running DX9. The developers themselves have even said that an updated DirectX would not provide a significant performance boost. But the point of this is to provide some understanding as to why even newer gaming rigs can sometimes struggle to run Guild Wars 2 at the highest settings. Many of the following tips are based around reducing CPU load when possible to increase frame rate. These settings should be the ones you go to first if you’re trying to increase performance without lowering graphics quality. These are also some of the most CPU intensive settings. Character Model Limit – Controls how many character models are rendered on screen. Has a large affect on CPU load. Recommend setting to Low or Lowest. Character Model Quality – Affects the textures and details of character models. Has a small effect on CPU and GPU load. Recommend setting to Medium. Animation – Affects movement of clothing, hair, water, etc. Has a small impact on CPU load. Recommend setting to Medium or Low. LOD Distance – Affects the quality and detail of far away objects and textures. Lowering this setting does not result in a very noticeable change in graphics quality. Recommend setting to Low. Effect LOD – Affects the distance at which fire, lightning and other effects are visible. Reduces CPU load significantly. Recommend setting to Enabled. Environment – Controls the distance at which environmental details are rendered. Unless you look really hard you probably won’t notice a difference. Recommend setting to Medium or Low. Reflections – Affects which textures and objects are reflected in certain surfaces such as water. Recommend setting to Terrain & Sky or Off. Shadows – Affects the quality of shadows cast by player and object models. Lowering this setting does not significantly affect graphics quality. Recommend setting to Medium or Low. 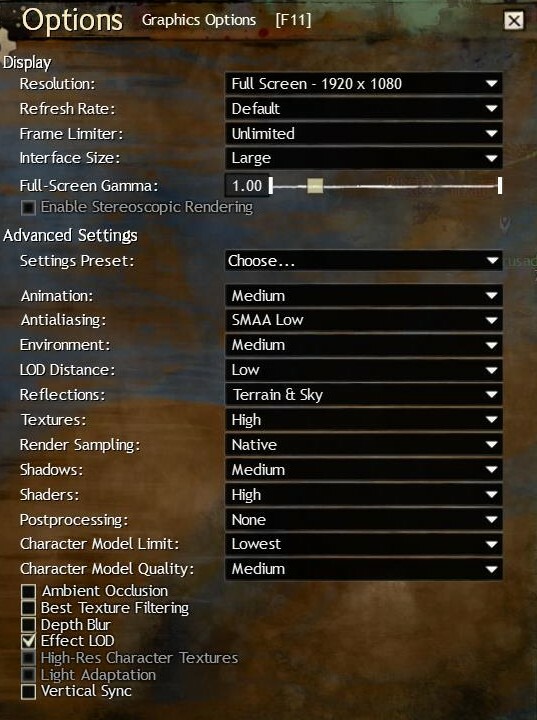 These are the settings that really matter when it comes to making Guild Wars 2 look its best. Lowering these should be a last resort if you want GW2 to look as good as possible. Resolution – You want to set the resolution as high as possible, ideally at your monitor’s native resolution. Anything less will result in a loss of sharpness and detail. Textures – Textures are one of the most important settings in terms of graphics quality. The characters and environments truly shine with textures set to high. Shaders – Closely related to textures. Turning up shaders gives depth and detail to the environments and models. Can be set to medium without a huge decrease in graphics quality. Note: The “Ultra” setting is very demanding and has a high GPU load. Render Sampling – This should be left at “native” for most people. Sub-sampling is blurry and super-sampling is graphically demanding. These settings can safely be left to their defaults but you may want to change them to fit your preferences. Antialiasing – This setting attempts to smooth out jagged lines. Some people claim that FXAA looks blurry, and I tend to agree. While it’s debatable as to which setting is optimal, the impact to FPS is minimal either way. Recommend setting to SMAA Low. Field of View – This is a general setting that affects the width of the viewing angle. Lowering the FOV can increase performance but at the cost a much narrower viewing angle. Recommend setting to Default. Vsync – Synchronizes the vertical and horizontal refresh rates to eliminate screen tearing. Has a significant impact on performance and should only be enabled if you have the FPS to spare. Recommend setting to Disabled. Collision Sensitivity – Another general setting that involves how sensitively collisions are detected between objects and character models. Decreasing this setting may give you a small FPS boost. Recommend setting to Low. These settings do not have a large effect on performance so choose whatever looks best to you. Post-processing – Lighting effects such as bloom. Ambient Occlusion – Changes lighting based on object position. Depth Blur – Gives far away textures a blue effect. Light Adaptation – Changes brightness based on player position. Example of in-game graphics using the settings outlined above.